Front or Top row (left to right): 1. unidentified, 2. Ronald Silcocks, 3. unidentified, 4. unidentified, 5. unidentified, 6. unidentified, 7. unidentified, 8. unidentified. Second row: 1. unidentified, 2. unidentified, 3. unidentified, 4. Nancy Tejada, 5. unidentified, 6. Diana Fabyan, 7. unidentified, 8. Barbara G..
Third row: 1. unidentified, 2. Kathy Brown, 3. unidentified, 4. unidentified, 5. unidentified, 6. Ino Pomeroy, 7. Connie Frame, 8. unidentified. Fourth row: 1. Tom Clarke, 2. Scott Dyson, 3. unidentified, 4. Dwain Glossip, 5. Austin Custodia, 6. unidentified, 7. unidentified, 8. Mrs MacDonald. Credits: Scanned by Ron Silcocks. Thanks to Ron Silcocks, Teresita (Burbano) Currie, David Smith, and Connie (Frame) Froehlich for identifying the kids in the picture. The class met at Eagles Hall because Junction Avenue School was not yet completed and the schools were overcrowded. 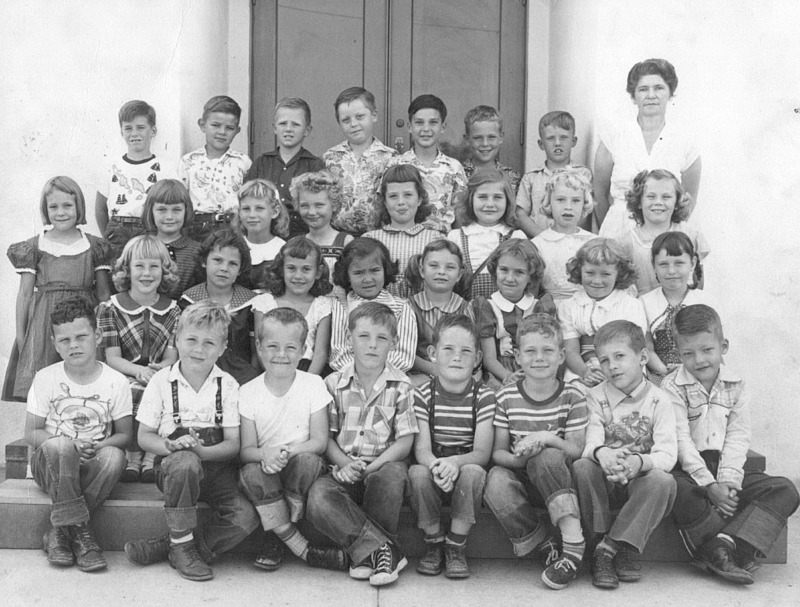 To find other pictures from Livermore Elementary School in the archive, see Livermore class pictures listed by school: Fifth Street School. And if you have any pictures from Livermore Elementary School that you would like to share, please submit them to the Archive.